What Day Is It? Oh, Who Cares, We’re Here! Canadian Battlefields Foundation > CBF Tour Blog EN > What Day Is It? Oh, Who Cares, We’re Here! We’re here! We did it! Some of us may not know what day it is or what time it is, but we’re here! I realize my blog post was only supposed to cover May 10, but because most of us haven’t slept since the 8th it might cover a bit more than just a 24 hour day. We technically started May 10th enroute to Paris on an incredibly enjoyable Air France flight which included free movies of your choosing, multiplayer battleship and TWO meals. We arrived in Paris around 5:30 their time this morning and after grabbing our rental vans, we hit the road! We stopped at a highway rest stop for a quick bite and then continued on to the town of Peronne to visit the Historial de la Grande Guerre. This museum was quite interesting since all of us had just visited the Canadian War Museum together and the layouts and materials used by the two museums are somewhat different. The museum in Peronne is largely based around material culture and presents the war through items like dishware, newspapers, visual art, and clothing. As a result, their message seems to always return to the war’s impact on everyday life instead of sweepingly national grand narratives. It also discussed people sometimes overlooked in these narratives, such as the Australians, Indians, and Turks. After visiting the museum, we continued driving through the beautiful French countryside, making our way towards the lovely Chavasse Farm. This place is amazing, we’re so lucky to be able to spend a few days here. It’s everything you’ve ever pictured in a French country house. 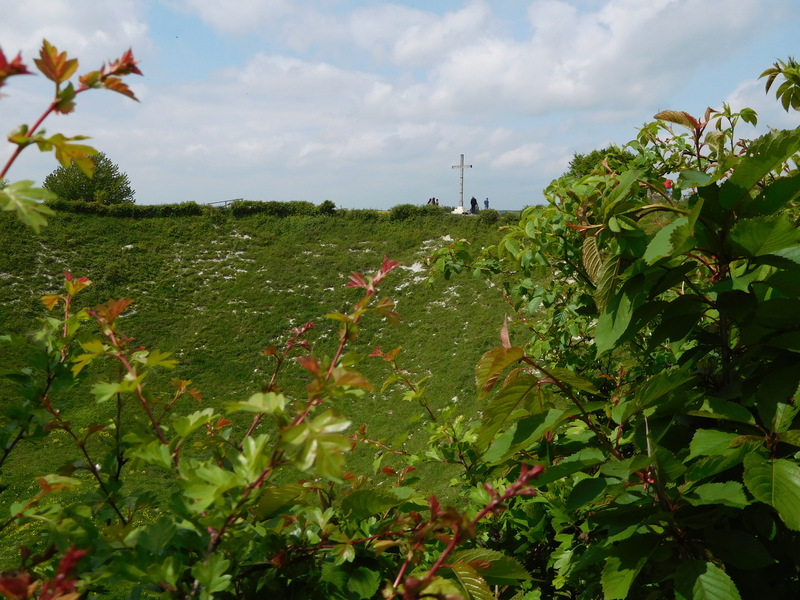 After getting settled in, we ventured out again to the Lochnagar Memorial Crater. We got to learn a little bit on the Somme there today as well as at the “Glory Hole” and at the cathedral in Amiens. We ended our day in Amiens, grabbing something quick for dinner. It was a very long, but exciting day! As I write the draft of this blog post, I’m sitting outside at Chavasse farm, looking over the fields of the Somme reflecting on how thankful and how happy I am to be here. I’m looking forward to a good night’s sleep tonight and to really diving into the Somme offensive tomorrow with Beaumont Hamel, Courcellette, and some of the major monuments and memorials including Thiepeval and Ulster Tower.